The seat construction of the Softshell Chair ensures a level of comfort that is first revealed upon use: vertical ribs concealed in the back shell adapt to the user, providing freedom of movement as well as superb comfort, even for prolonged periods of sitting. Flexible upper backrest shell. Seat and backrest shell in fibreglass-reinforced polyamide. Seat and backrest upholstery in polyurethane foam. Armrests are integrated in the seat shell. Version in leather with two seams along the sides of the backrest. Polyamide in chocolate or basic dark with glides. Flexible upper backrest shell. Seat and backrest shell in fibreglass-reinforced polyamide. Seat and backrest upholstery in polyurethane foam. Armrests are integrated in the seat shell. 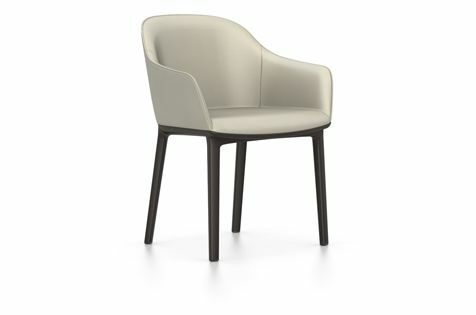 Version in Laser fabric and in leather with two seams along the sides of the backrest.